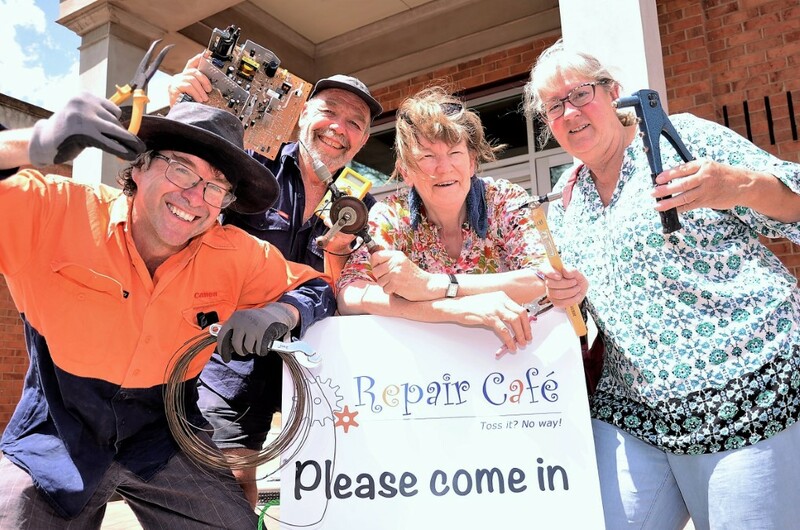 Bergen O'Brien, Martin Lafitte, Chris Hooper and Alison Ross get ready for the return of Castlemaine's successful Repair Cafe. 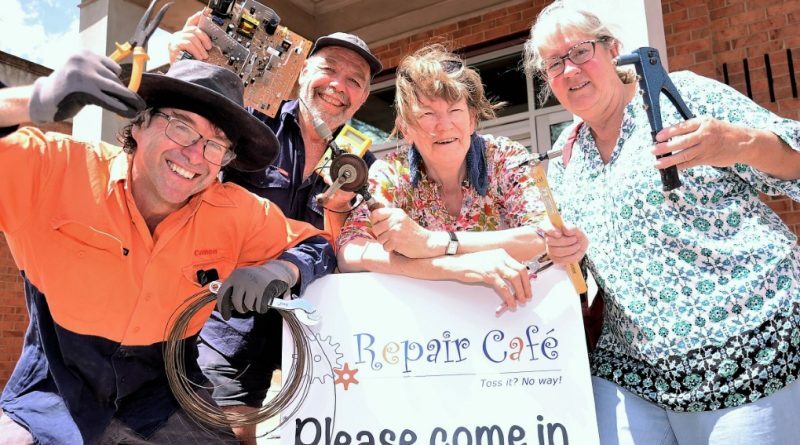 Castlemaine’s Repair Cafe is getting set to return for 2019 bringing broken or dysfunctional goods back to good use while diverting waste from landfill. And as the eager band of Repair Cafe volunteers prepare to get going in their brand-new venue of the Castlemaine Town Hall, that’s not all they’ve been achieving. “It’s been fabulous. People love it,” says Chris Hooper, founder and coordinator of the local repair cafe. The Repair Cafe takes place on the last Sunday of the month with tea, coffee and light refreshments available for a small donation that helps keep the Repair Cafe running. Broken lamps, vacuum cleaners, sewing machines, toasters, furniture, backpacks and tents are all among the wide assortment of items that have been repaired since the cafe started. “On good days you can fix everything,” volunteer electrical repairer Martin Lafitte says. Volunteer repairers say part of it is sharing useful repair skills that cafe users can then apply themselves – and enjoying the sense of empowerment and community that comes from that. “We’re a project through the Mount Alexander Sustainability Group and we’re also part of an international network that started in Holland,” Chris says. She says volunteers include people with a wide range of repair skills including knife-sharpening, electrical, mechanical and furniture repair know-how and sewing and darning skills. Local resident and Repair Cafe volunteer Alison Ross is among four or five of the volunteer sewing fixers and attends the cafe equipped with her trusty sewing machine. “It’s about sustainability,” she says. The volunteers note that there are some things the Repair Cafe doesn’t fix including broken zips and scratched DVDs. “We don’t want to take away from local businesses and we do refer some things on to local businesses,” Chris says. The first Repair Cafe for 2019 is set for 10am-1pm, Sunday February 24 in the new town hall venue, replacing the Ray Bradfield Rooms used last year. Chris says new repairers and helpers always welcome with more information is available on the Castlemaine Repair Cafe Facebook page or phone 5470 5508. 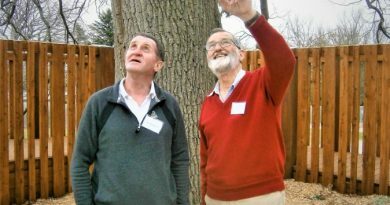 Very impressed: Wurundjiri Elder Perry Wandin (at left) and former Romsey Primary School principal Trevor Turnham - in charge at the old school for 11 years and the current one for five - chat beneath the historic oak tree featured in the park section. Both were highly impressed with the transformation of the old school and first stage of the ecotheraphy park. Perry spoke earlier to the gathering about traditional owners' involvement in the Macedon Ranges. 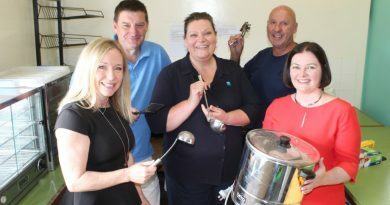 Federal Member for Bendigo Lisa Chesters (right) met with KFNC president Karen O'Sullivan, vice-president Rob Waters, canteen manager Sherene Blythe and building coordinator Carl Morris last week to announce funding for a new-look kitchen. 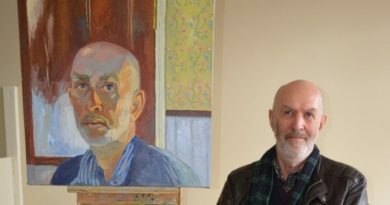 Castlemaine artist Mark Dober is pictured with his self-portrait.